Tickets is Josef Summs, one half of brotherly duo Brethren. 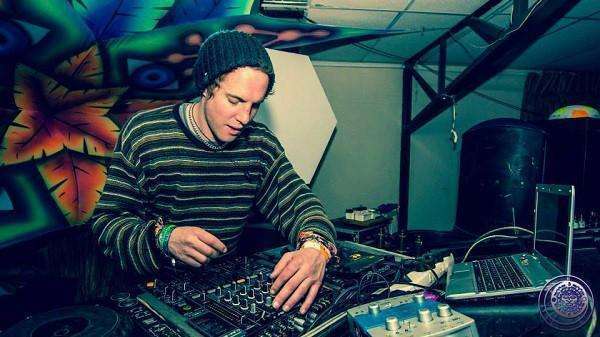 Josef grew up around many of South Africa’s first wave Psytrance artists, including his brother Phyx, who he performs with in Brethren. All three projects were showcased recently at The Dark Moon party hosted by Full Moon Events, for the first time in a number of years. We caught up with Tickets, to find out how his recent trip went, and what’s in the works for his numerous projects. Psymedia : Hey Josef! How did you become involved with Psychedelic Trance? Tell me about the scene when you started out – what parties and artists inspired you? Naturally I’d assume having a brother involved with the scene shaped your sound. Tickets : I was listening to Psytrance before I went to a (Psytrance) party. My mates were buying vinyls back then, and all of them, including my older brother, had techniques 12 10 turntables. He painfully hauled them back with him to South Africa after his travels in the United Kingdom and abroad when he finished High School. We would pretty much do the same thing every day back then – get school out of the way, after school skateboard until we were exhausted and then finally my two older brothers and I would mix vinyls that they had ordered from overseas until the sun went down or my mom or dad called us in for dinner time. Back around 1996 or 1997, my two older brothers and sister took me to a Vortex. Antaris was playing and the dance floor was on an island in the middle of a lake or dam. It was interesting for me as a first impression of what parties were like, having only listened to the music and mixed it at home. I really enjoyed it! After that, my brother took me to an Alien Safari out in Scarborough, and Dhya Droidlock was playing. From there I used to just tag along with my brothers and their friends ( who were about 6 or 7 years older than me ) to various psy events. I saw Tsuyoshi Suzuki play several times. I used to dig his old stuff from his label Matsuri Records, and he had legit tracks for the time and era. His music was super good. I saw Joti Sidhu play 3 times I think, that was when Silverstroom (a venue up the West Coast of South Africa) which was still rented out for events. After that I was hooked on Psytrance. I somehow got lent an Apple laptop and I had Reason installed on it. I spent a long time developing sounds and learning the program. I used to spend so much time learning Reason, I pretty much did nothing else. It was around that time I got my first release on Timecode, and another shortly afterwards on Alien Safari. I was also surrounded by people in my social network who were at higher levels of production than me. Guys like my brother Phyx, Shift, Rabdom L, Artifakt and Damage. I would also spend most weekends with my two brothers, Pieter and Ian, in their house in Observatory and there was always the same crew in their house. It was like some era in the art movement for me, all these guys who were constantly playing each others music to one another and looking for ways to make it sound better. I was right there taking notes the whole time. I would often get the guys to take a quick look at my track and tell me what they thought. But in all honesty, I would of never really developed my sound if it weren’t for the classical piano and flute training on theory that I studied in school. Psymedia : So theory was more important than the creative part? Tickets : I can’t really say which aspect helped me more. All I can say is that all the people I know that produce, like my network, just had a nack for it. For me it was theory that helped me produce my style and I have a large chain of students, ranging from Japan to the United Kingdom that I teach. I guess because they contact me for Cubase lessons, they like my melodies and my style, and perhaps even though they are very creative they don’t know how to make extensive melodies or produce melodies in key, and so on. Psymedia : How do you think the scene has changed since you started out? Tickets : How do I think the scene has changed since then? Hmm, good question. Well, of course it has become bigger, and more money is being taken and spent on events. Those are obvious factors. But the smaller parties back then were the bigger organisations. So it was a different time and a different feeling. I’m sure a lot of people will agree with me when I say that I preferred it back then, when it was just a handful of troopers. But hey, I’m glad that the music and the scene has become noticed and received exposure, which is great for the Psytrance movement. Psymedia : Do you still feel connected to Cape Town and its scene? What was it like playing at The Dark Moon? Tickets : Yes I still feel connected to the scene in Cape Town, but because it has multiplied in size, obviously my connections remain with the scene I knew back then. The Full Moon crew contacted me last year in May 2012, saying that they were interested to book me back down in South Africa. We had a few exchanges of emails and an idea was set in place for Brethren and Tickets to perform in South Africa. Schalk and Tommy were the ones I was speaking with and I explained to them that if they were willing to pay for my flight to Cape Town, I would do a Brethren and Tickets set. I like the Full Moon guys a lot because they are organised, humble, friendly and stick to their agreements. They’re also into surfing which was a mutual topic. In fact, they even got my surfboard repaired for me while I was in Cape Town – now that is what I call an organisation! I guess I also liked them because they remind me a lot of myself when I was their age, and they also remind me of how Timecode was when they used to throw parties. Thanks again to Full Moon for the special memories of Cape Town. Hands down, Stellies is an awesome crowd. Psymedia : You spent some time living in America. Did anything inspire you (in terms of the music you made) whilst in America? Tickets : Yes, I found unbelievable inspiration. I went to a couple of rock concerts out there. I was lucky enough to see one of my favourite bands play – M83. They have had a huge impact on my sound lately, and the direction and the ideas that I’m going for these days. Also now, more than ever, I am trying to get my foot in the door with my true passion which is sound design (movie scoring, and so on). Psymedia : And how does that differ to writing psy? Tickets : Movie scoring and sound design have always been a dream of mine. Hanz Zimmer is a big influence to me. It is all relative to how connected you are (in this field), but to put it bluntly, sound design is harder to do. You need to be capable of writing sheet music (theory), and so on. Plus you have to be musically trained. Psymedia : I believe a new Brethren EP is in the works. Could you tell me about that, and why you are able or want to put something new together now? Tickets : Well, it has been a while since we released anything, and we thought it would be fun to do something new. We also have developed more of a international fan base now – since we have been dormant, which is kinda ironic. But yeah, we just want to give something to our fans, something fresh. Hopefully it would be done end of this year 2013. Psymedia : Do you think it’s difficult to write new music for fans who like your old stuff? Balancing that old sound, but at the same time keep it fresh? Tickets : Now I am more into more orchestral style music, and before my stuff was very generic and just the same old for me, the same old formulas. Now I write what I like, and I am always testing the limits I can go with my music. I would prefer to make music that is substantially different from the generic, and what is considered popular sound. But OK, yeah, I do still have certain sounds from my old music style that I still struggle to let go of, so I still use those sounds and formulas up to a point, even today. Psymedia : What has it been like relocating to Germany? Is Germany a good central base for psy artists? Tickets : It’s been great relocating to Germany, in general it has a good electronic scene, but I wouldn’t say it’s a good place for a Psytrance artist to be. The only reason I stay here is because I have really good friends here. My mate Daksinamurti stays close to me, and because I have an American visa, Germany is a convenient country for me to stay and study in. Right now I’m in the process of enrolling to study Deutch. Psymedia : You’ve got a new project with Daksinamurti called Android Spirit. How did you guys come together, and how would you describe your sound? Tickets : Daxi and I met in South Africa around 2006 or so. We instantly hit it off, and whenever he was in South Africa, afterwards he would stay with my parents or myself, and he has been kind enough to return that hospitality to me in Germany when I first moved here last year. I guess we got along well because Daxi likes the Timecode sound, and I was impressed he liked it so much back then, so we became like brothers in arms. And now we have a live act – Android Spirit! Psymedia : You’ve got a new Tickets compilation entitled Android Wave, too. I believe it was the first CD printed by Timecode Records in a number of years. Tell me about some of the tracks and collaborations you’ve selected. Tickets : I tried to select some of the old guys, coupled with a few new ones that I think deserve it. I had actually never met or heard of Terrafractyl, but Daxi and another friend Chris Stark, who had met him before, apparently had been trying to get us to do some music together for a while. I think it’s because we both studied classical music, so our sounds have similar parts in it, and that same orchestral feel. I contacted Terrafractyl, Earworm and Hujaboy, and just asked them if they would be keen to make a track with me. Earworm has always inspired me, and he is just such a humble genuine person. Writing music with him was hassle free. I did collaborations with Abomination and Dillan M too, under my new project Android Spirit. Psymedia : Tracks with Shift and Mad Piper in the works I believe? Any other collaborations with other South Africans? Tickets : Yes that is correct. I also plan to do some collaborations with Shift, Artifakt, Distant Touch, Parana, Glitch, Critical Mass, Hysteria and Hiyarant. I plan to either remix each others track sometime soon too. Basically I would remix one of his and he would remix one of mine. Psymedia : You’ve also dabbled with some other sounds. Tickets : Yes, I have an active chill out project called Init Patch. It’ something new I have been messing around with, and have a few tracks on my Soundcloud. It’s not labeled as Init Patch, just as Tickets, but it’s under my chill out set on Soundcloud. Tickets : Lots! There’s two Tickets vs Terrafractyl tracks in the works, as well as collaborations with Earworm, Shift, Concept, Mr Peculiar, Infektion, Egorythmia, Catarsis, Damage, CPU and Soladria. A new Android Spirit album and Tickets album number three is also on the way. Exaile vs Tickets EP will be released end of summer 2013. Psymedia : Thanks for the interview! Any last words before we end off? Tickets : It has been great, and I hope that I hear from you boys again soon. Thanks for the interest and good vibes to you all.